As most followers of my work know, I am a huge fan of Participate, the collaborative professional development platform. The many additions and changes that they have introduced over the just the past couple of years have been amazing. I began using the app curation tool back in 2013, building collections of iOS and Android apps that were easy to share. Gradually, this expanded to allow online videos and websites in collections. Then they added the incredible Chats feature, revolutionizing educational Twitter Chats. The Chats feature eliminated the two primary obstacles that had kept me from becoming an active participant in chats- remembering to include the hashtag and losing resources because they went past too quickly. When VIF International Education purchased Participate (and subsequently took the Participate name) they added online courses. The courses, many of which are created by Participate while others are presented through Participate by a variety of partners, have turned Participate into an amazing educational platform. I often describe the platform as covering the three Cs- Collections, Chats and Courses. I also was an early user of eduClipper, the educational bookmarking tool originally founded by EdTech Rock Star, Adam Bellow. eduClipper was constantly adding features as well and soon integrated social sharing tools, the ability to “clip” anything (pictures, files, even mini-whiteboard sketches), and portfolios. It is mid-June and that means it is time for a barrage of EdTech related updates and news announcements. As a Participate “insider”, I was aware of some planned updates. On the eve of ISTE, Participate unveiled a planned update of the Participate website, especially the Chats area. They also released Chats as an iOS app. I was asked to beta test the app and while there are a couple of “missing” things that I hope are brought over to the app, overall it is a great experience for mobile participation in Twitter Chats. ’17. Oh, how wrong I was! Saturday afternoon, the news broke that Participate would be acquiring eduClipper. While no financial details have been released, I’ll first say that I am happy for Adam Bellow. I once had a great conversation with him sitting outside the conference rooms of the Tennessee Educational Technology Conference two years ago. (This conversation actually included Adam, Kathy Schrock, Leslie Fisher and myself- yes, to that point in my EdTech life, I felt I had reached the pinnacle.) Part of that conversation included Adam describing some upcoming updates to eduClipper and talking about how it was getting pretty big. He certainly wasn’t complaining but I had the impression that he was realizing that it was growing to a point that it would require a more substantial team to support its growth. 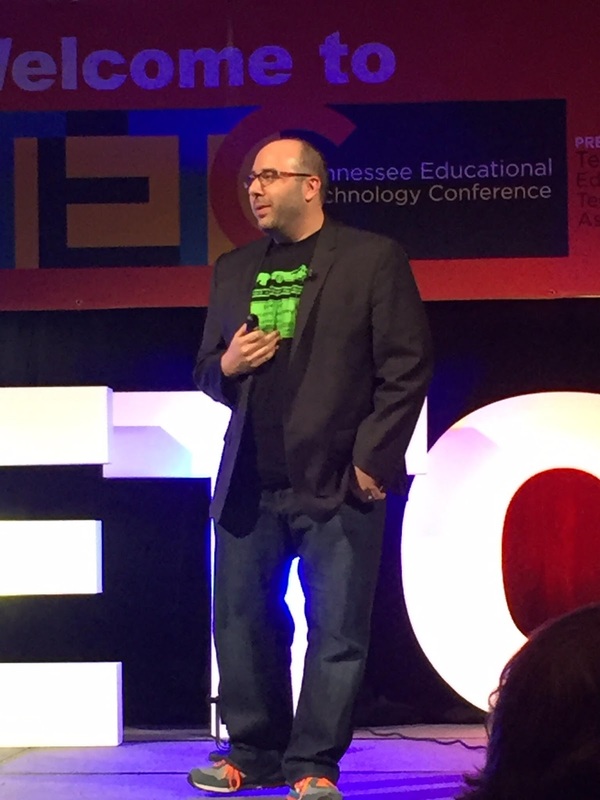 Tennessee Educational Technology Conference, 2015. 1. I have previously used, and promoted, a rebellious adaptation of Participate collections for use as lesson plans. (See https://www.youtube.com/watch?v=2QgyakV2N2M). It seems like the assignment feature in eduClipper could be easily merged with collections as an optional feature to create a guided lesson for students. 2. Imagine a smartphone/tablet app interface similar to the current eduClipper app that fed “clips” directly into new or existing Participate collections. Then I could add photos, videos or other resources directly from my phone. I picture myself at a conference or EdCamp just snapping pictures of presentation screens and student showcases to save in collections. Then I link the app used into the collection. Oh, and they have some student samples, let’s scan those into the collection as well! 3. There are already several student portfolio apps but those that I have tried don’t really fit the bill for educator portfolios. I envision a special version of a Participate collection that could serve as an ongoing professional portfolio. It should be shareable in a format that is professional enough for my preservice teachers to share with a principal during a job interview but flexible enough to include a variety of products. Adding the products to this portfolio collection should be easy from an app or the browser. I look forward to what the Participate team has in store for eduClipper and the increased power to collaborate among educators. I see great potential in the combined features of these two wonderful platforms. My imagination continues to envision new uses for this combined educational powerhouse.